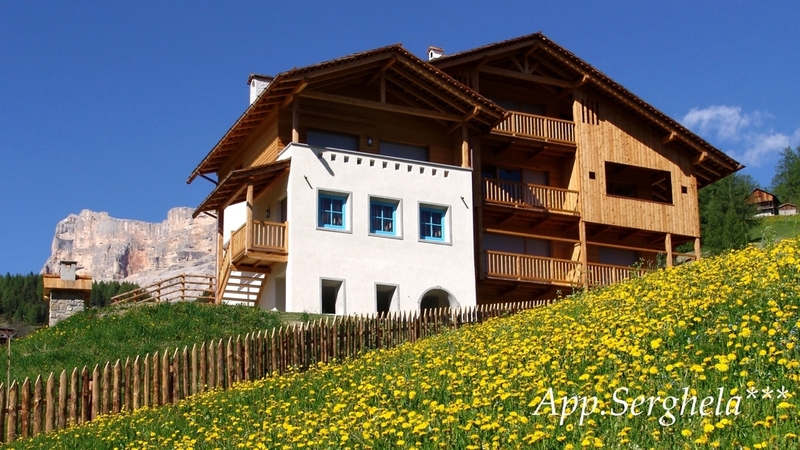 New apartments for 2-7 persons, in a sunny and quiet position in the heart of the Dolomites, garden with playground and barbecue, ski and bike deposit – ideal for nature lovers and adventurers. 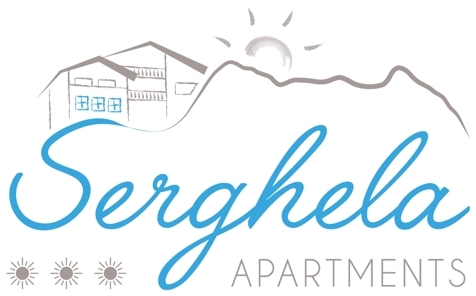 Welcome to Apartments Serghela in St. Kassian! We welcome you in one of the most beautiful valleys in the Dolomites, surrounded by impressive mountains like Mt. Heiligkreuzkofel, Mt. Lagazuoi or Mt. La Varella. Our apartments are located in the tranquil and sunny hamlet Costadedoi, not far from the popular vacation spot St. Kassian. Our romantic and comfortable holiday flats are situated in a new house, which was built according to original Ladin traditions. The apartments of different sizes are furnished for 2 to 7 people. All have double bedrooms and if required extra beds, a fully equipped kitchen, bathroom with shower and WC, washing machine and dishwasher, as well as a balcony with view to the mountains. Bed linen and towels are available too. Ciasa Serghela offers also a well-kept garden with deck chairs, children's playground and barbecue, a private car park and a storage room for bicycles and skis. In winter, the ski lifts and cross-country ski runs around St. Kassian and Stern are easily reachable. In summer, the area nearby Armentarola is a paradise for passionate hikers, nature lovers and adventurers. Apartament "TYPE A“ - 30 m² for 2/3 persons 1 double bedroom with additionaly bed and dining table. Kitchen with dish washer and dish-liquid, fridge with freezer, electric glass ceramic cooking stove and microwave. 1 bathroom with shower, wash basin, toilet, bidet, hair-dryer, washing machine, towel dryer, floor heating. Large south facing balcony with table and chairs and view of the mountains. Satellite TV-radio, internet WI-FI, safe, bed linen, towels and dish towels complete the equipment of the apartments. Apartment "TYPE B“ - 45 m² for 3/4 persons 1 double bedroom. Kitchen with cosy living room with double-bed couch, dish washer and dish-liquid, fridge with freezer, electric glass ceramic cooking stove and microwave. 1 bathroom with shower, wash basin, toilet, bidet, hair-dryer, washing machine, towel warmer, floor heating. Large south facing balcony with table and chairs and view of the mountains. Satellite TV-radio, internet WI-FI, safe, bed linen, towels and dish towels complete the equipment of the apartments. Apartment "TYPE C" 6 - 67 m² for 4/6 persons 2 double bedrooms. Kitchen with cosy living room with double-bed couch, dish washer and dish-liquid, fridge with freezer, electric glass ceramic cooking stove, oven and microwave 1 bathroom with bath, double wash basin, toilet, bidet, hair-dryer, washing machine, towel warmer, floor heating. Large south facing balcony with table and chairs and view of the mountains. Satellite TV-radio, internet WI-FI, safe, bed linen, towels and dish towels complete the equipment of the apartments. Apartament "Type D" - 69 m² for 4/7 persons 2 double bedrooms with additionaly bed in one of the two bedrooms. Kitchen with cosy living room with double-bed couch, dish washer and dish-liquid, fridge with freezer, electric glass ceramic cooking stove, oven and microwave. 2 bathrooms with shower, wash basin, toilet, bidet, hair-dryer, washing machine, towel dryer, floor heating. Large south facing balcony with table and chairs and view of the mountains. Satellite TV - radio, telephone, internet WI-FI, safe, bed linen, towels and dish towels complete the equipment of the apartments. Apartment in the loft "TYPE E“ - 70 m² for 5/7 persons 2 double bedrooms and a single bed in one of the two bedrooms. Kitchen with cosy living room with double-bed couch, dish washer and dish-liquid, fridge with freezer, electric glass ceramic cooking stove and microwave 2 bathrooms with shower, wash basin, toilet, bidet, hair-dryer, washing machine, towel warmer, floor heating. Large south facing balcony with table and chairs and view of the mountains. Satellite TV-radio, internet WI-FI, safe, bed linen, towels and dish towels complete the equipment of the apartments.